There is a vast amount of complex applications that require support rollers with specific characteristics, which is where we believe to be very competitive with our deep experience in the majority of the main industries. Troubleshooting is normally how we begin relationships with new clients, after having hopefully solved their problem or improved their product, a test order for maintenance follows, after which the cooperation really gets going. All our customers appreciate our high quality standards and fast delivery times. We also try to come up with new solutions to provide simpler production processes and lower costs for our customers, such as choosing to grind before recapping, if feasible. We will always be there to solve your problems if breakdowns occur or production halts. 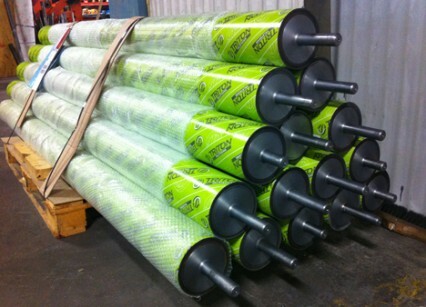 Having access to a complete, onsite roller workshop means that we are able to shorten lead times and increase quality.